Featuring a smooth, cylindrical design, these CAC SHA-17 Sushia 8 oz. 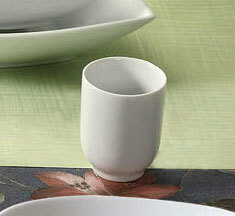 porcelain tea / sake cups are made with an oriental influence that will add a cultural element to any restaurant. They are perfect for giving any establishment a stylish, upscale decor.